Captain Hamish Barne (former Scots Guards) and Captain Charles Dale (former Life Guards) are due to drive from London (UK) to Cape Town (South Africa) in aid of the Scots Guards Colonel’s Fund and the Household Cavalry Foundation. In the last year they have both left the army and now get the once in a lifetime opportunity to take on the “London to Cape Town Challenge”. The Challenge is to drive from London to Cape Town with no support team. Between the two of them they have done 5 operational tours; 4 in Afghanistan and 1 in Iraq and so they have decided to carry out this expedition in aid of the Scots Guards Colonels Fund and the Household Cavalry Foundation. You can follow their progress and support the charities at online (address to follow) once they depart on 10 January 2014. Thank you very much for any support that you can offer. 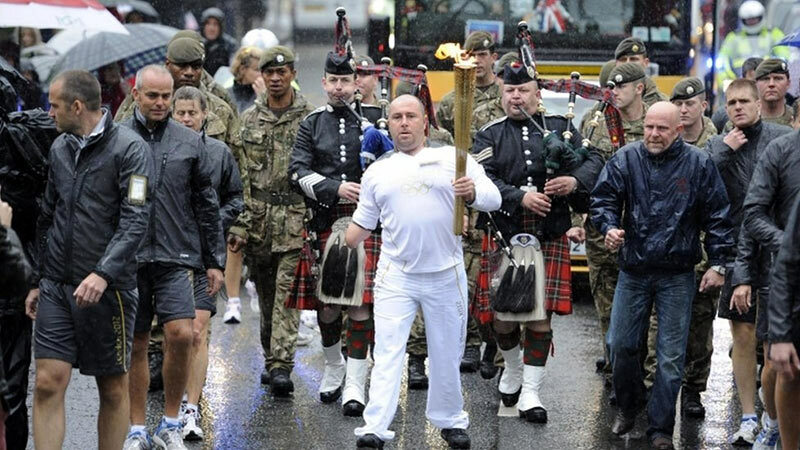 Despite the pouring rain, Guardsman Dave Watson from Bamber Bridge, who lost both legs and his right arm whilst serving in Afghanistan, carried the Olympic Torch through Lancaster. He was joined by fellow Scots Guardsmen, members of the public and his proud father Kevin. Well done on this tremendous accomplishment.